It’s called clearing the backlog. Goodness me it’s taking so much longer than I’d anticipated. 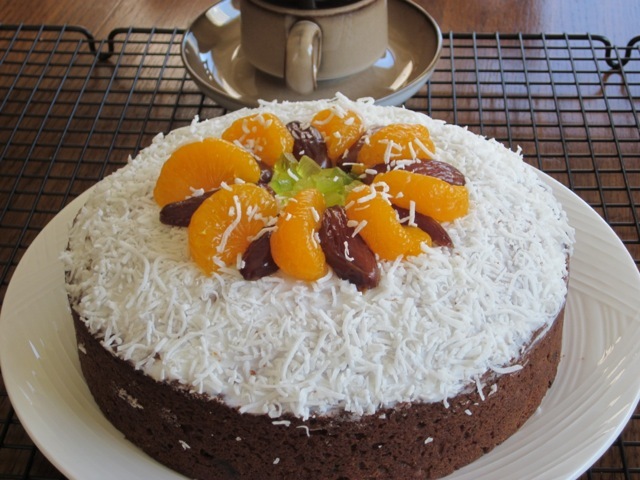 I baked this cake in September last year and have probably baked it 3-4 times more. 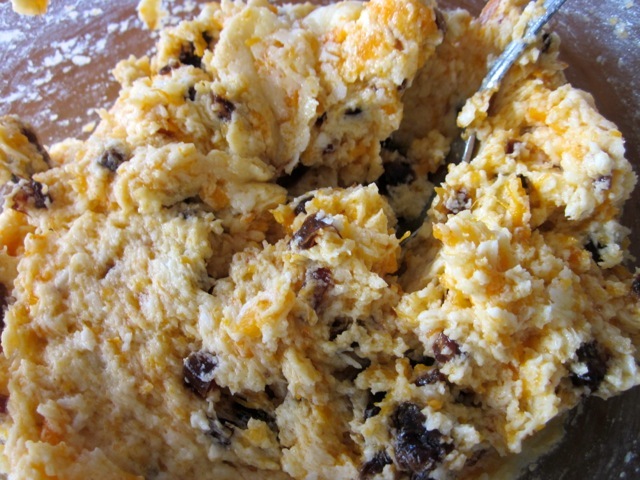 Every time I boil or bake sweet potatoes I save some for my favourite cake and scone recipes. I seem to have a soft spot for sweet potatoes. What do you have a soft spot for? That ingredient that always seems to lodge itself in your list of ingredients without much thought or planning. But after a while you look back and wonder why you always include it. 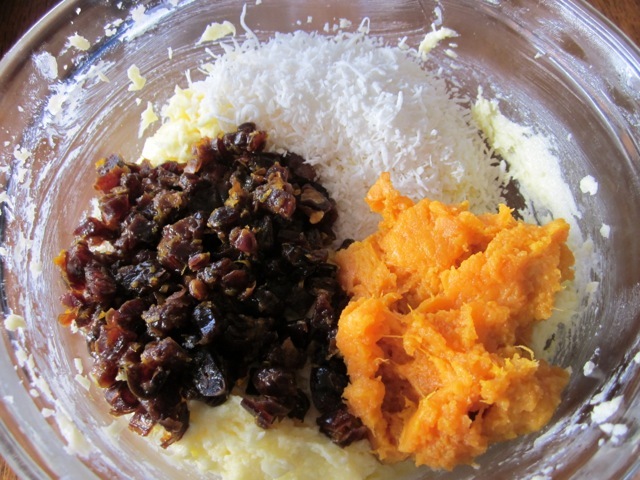 That is sweet potato for me…and apricots…and dates. I have to start making a list of neglected ingredients then go ahead and force myself to use them. I have never posted a recipe with beetroots for example…and healthy ingredients like wheat germ, or oats or quinoa or some of those so-called “ancient grains” like freekeh, teff, farro, kamut and amaranth. Okay so next time I bake I shall most definitely add an “ancient grain” to my batter or make a quinoa salad or make some teff flatbread. Oh I’m already looking forward…but watch out I tend to be the worlds greatest procrastinator so it might take another 3-6 months. I hope you’re enjoying your weekend. I’ve been bogged down the whole day trying to catch up, but it was kind of fun. I wish you a pleasant Sunday and a happy blogging. 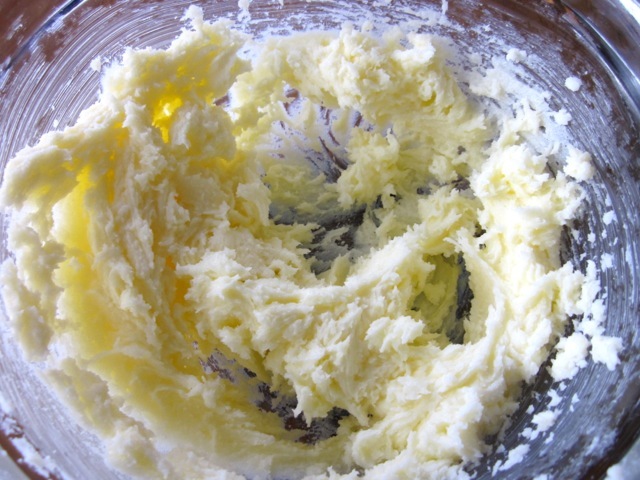 with an electric mixer until light and fluffy. Beat in eggs, one at a time until combined. 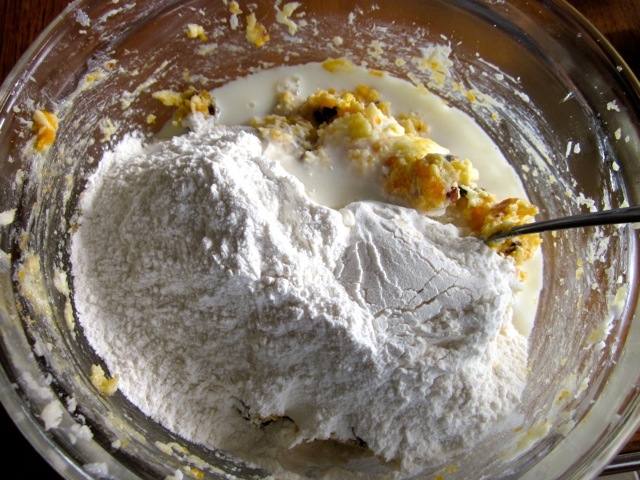 Stir in half the sifted flour and milk and then stir the remaining flour and milk. 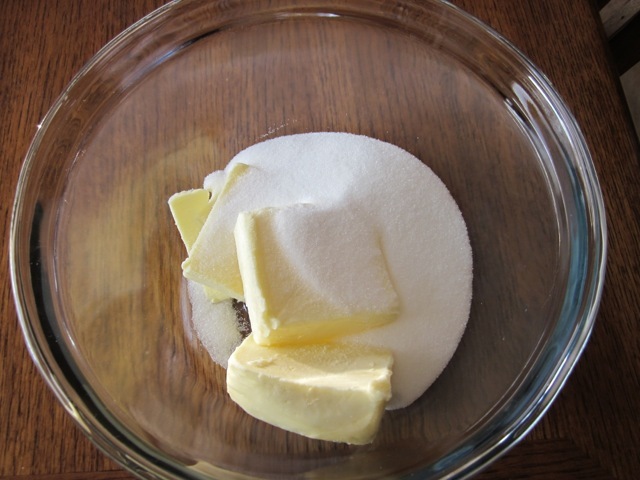 Spread the mixture into the prepared tin (pan) and bake in at 325°C (160°F) for about 1¼ hours. and then transfer onto a wire rack to cool. Grease and 8½” round tin or 8 inch square tin (pan) and line the base with parchment or greaseproof paper. 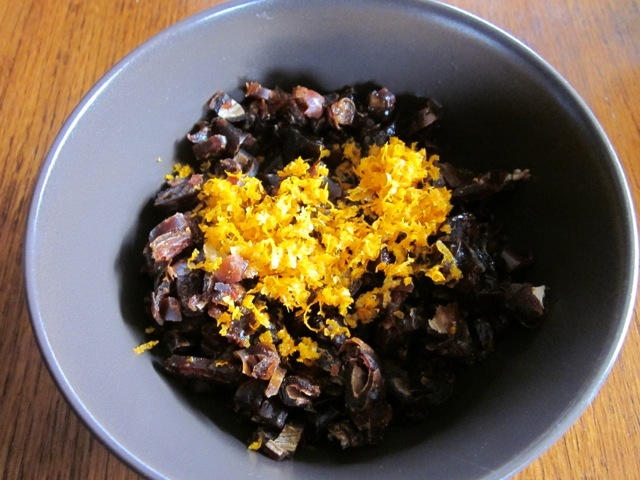 Combine the dates with the orange juice and rind (zest), and mix thoroughly. Sift the flour. Preheat oven to 325°C (160°F). 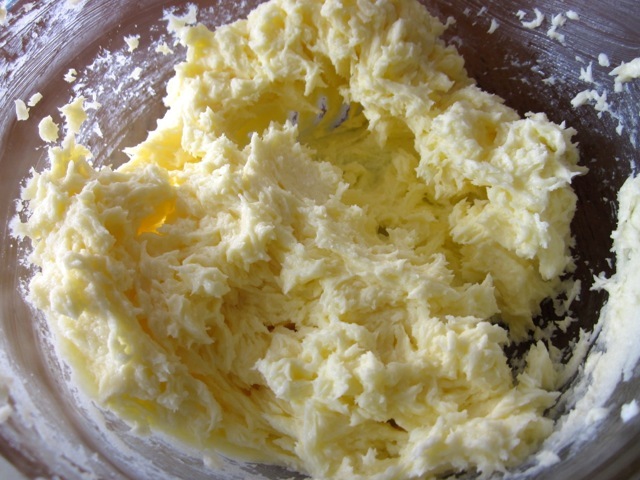 Cream butter and sugar with an electric mixer until light and fluffy. 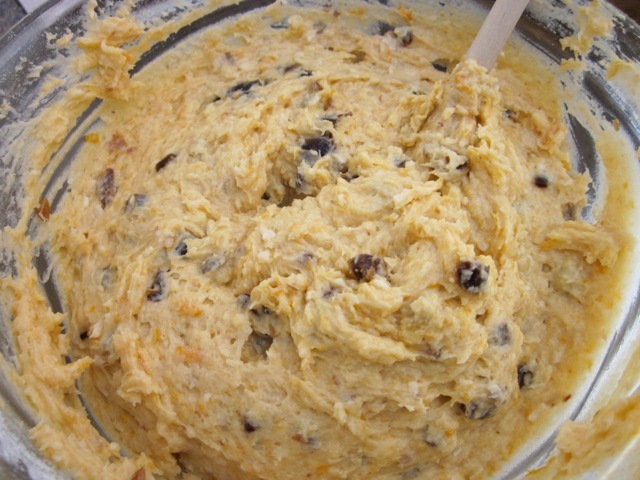 Fold in dates, coconut and sweet potato. 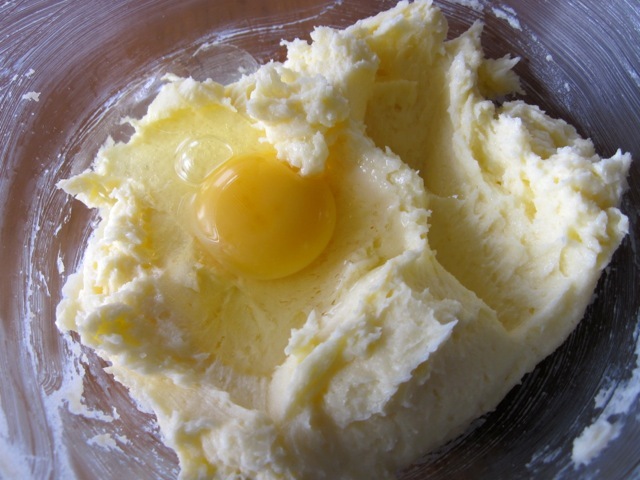 Spread the mixture into the prepared tin (pan) and bake at 325°C (160°F) for about 1¼ hours. Stand 5 minutes before turning on wire rack to cool. Decorate and ENJOY. 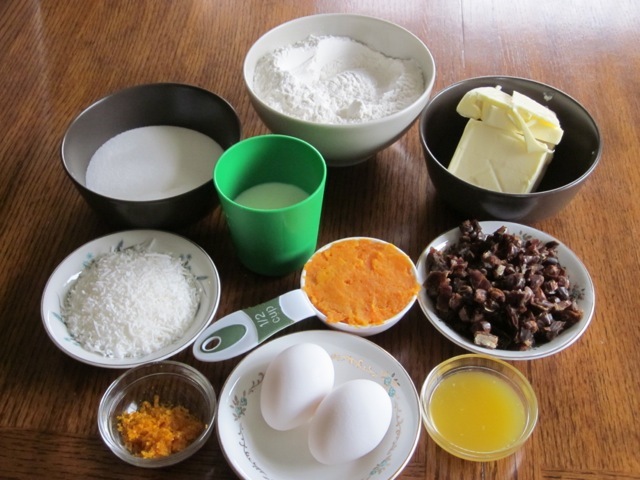 *I weigh the flour and butter, I do not use cup measures as the weight of a cup of flour tends to vary based on individual interpretation or publication, (from 125g to 130g to 155g per cup). Cup measures based on 1 cup = 125g flour so that would be the US cup of 240ml, not the Australian Cup. Please note that oven temperatures are given as a guideline only. You may need to add or reduce the suggested temperature depending on your oven. I baked at 330°C (165°C) 1 hour then, reduced to 325°F (160°F) for the last 15 minutes. Total baking time 1¼ hours. The cake is not very sweet. If you want it sweeter add 250g (1 cup) sugar. I always weigh ingredients, especially the flour and butter. 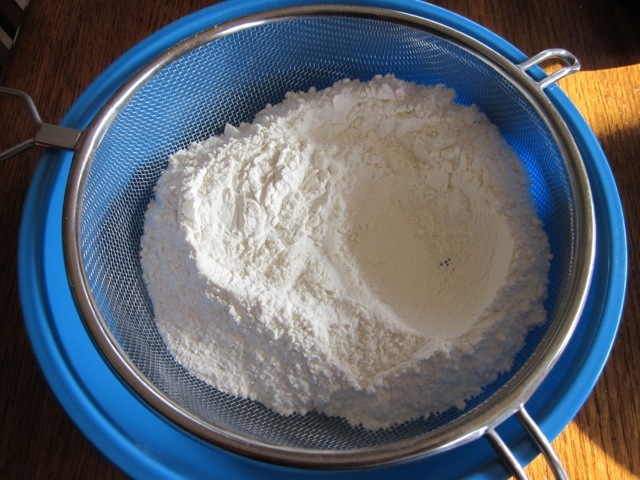 You can use cup measures, but please note if you scoop flour directly from the bag you will end up with 150-185 g of flour instead of the recommended 125g. I suggest you spoon the flour into the cup, heaping it up over the top, then slide a knife across the top to level off the extra. Be careful not to shake or tap the cup to settle down the flour or you will have more than you need. You can also sift the flour first then scoop. Best advice: use a weighing scale, you’ll get the best results. Cup measures based on assumption that 1cup = 125g flour so that would be the US cup of 237ml, not the Australian Cup. I am making this today!! Happy baking. Please give me a feedback! Hi Liz! Long time no see. Glad to see you’re busy blogging again. 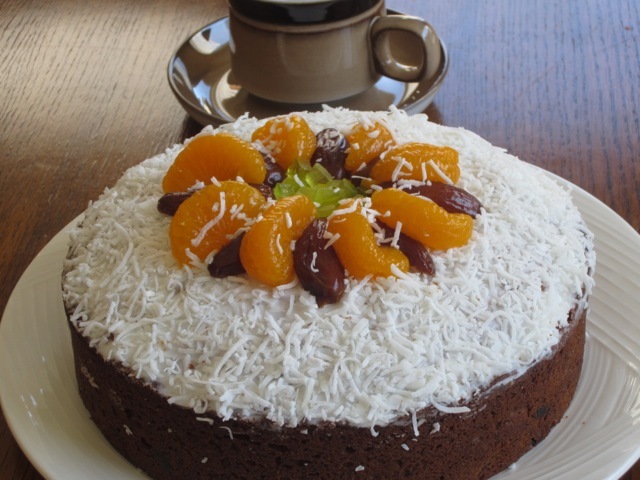 I will have to share with you a recipe I have for chocolate quinoa cake. I’ve made it many times and it’s absolutely delicious. My gluten-free friends have to fight off my non-gluten-free friends for a slice! I have a saying- Seafood and eat it (see food and eat it). I seafood and eat everything. Thanks for making me laugh! 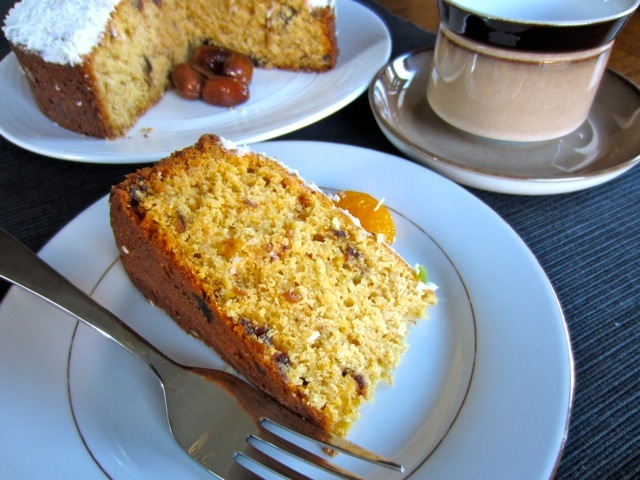 Since I’ve unlock my passion for dates I have to try this cake! 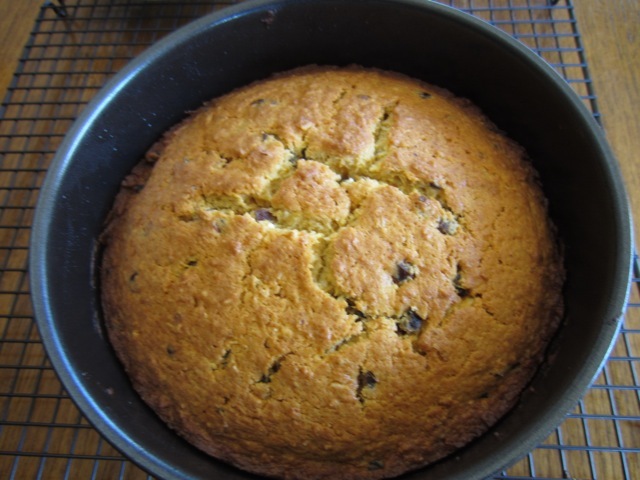 It looks amazing… I love that you used sweet potatoes! Thanks so much for complimenting. 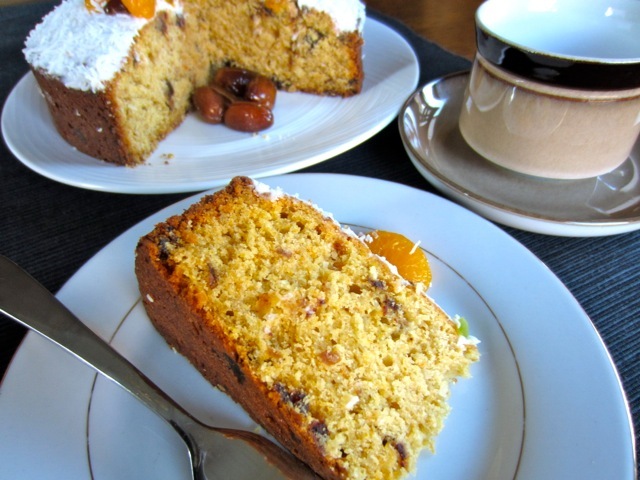 I wish you a very happy week and a happy baking! Yum! 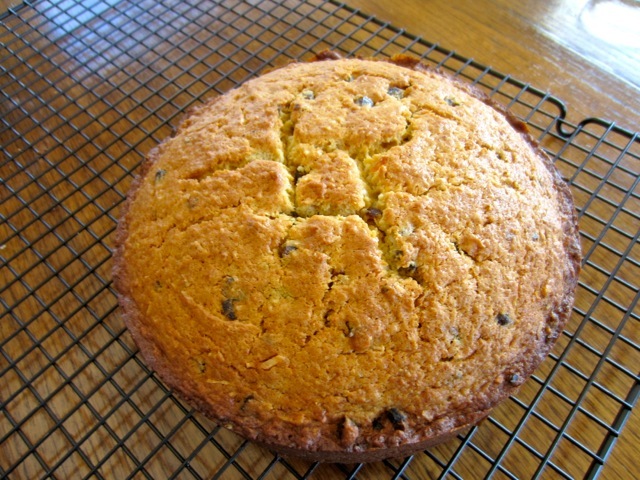 Sweet potato cake sounds good! It loks delicious! greetings from Italy! Omg how nice of you to send me greetings all the way from Italy. I’ve received the greetings with a big smile. Greeting to you from Canada. Have a lovely week! Thank you, Dimple. I hope you’ve had a lovely Sunday? Yes it was nice! The weather was good so even better! Glad to know. Wish you a fantastic week! You’re revealing a whole new baking ingredients universe for me, Liz! I’ve never used sweet potatoes nor coconut (yes, you’ve read it right!). Thanks for visiting me on Facebook. You should try using sweet potato and coconut. 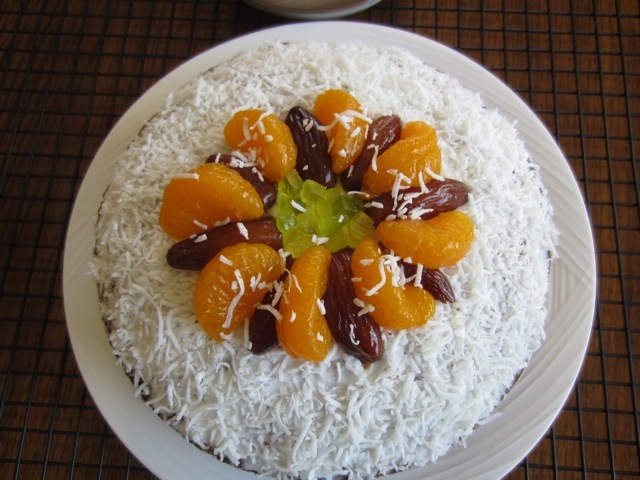 I’ve got a lot of coconut cakes on the blog. Ha ha you’re welcome to this cold end of the world for a cup of tea..We really hope there’ll be no more snow…until spring officially begins. Have a lovely Sunday and a great week ahead! Not sure what my favorites are. I go through phases, chocolate, cinnamon, vanilla, almonds, citrus… Right now I have a tart crust cooling waiting to be filled with cream and strawberries. Almost made a loaf of bread today. 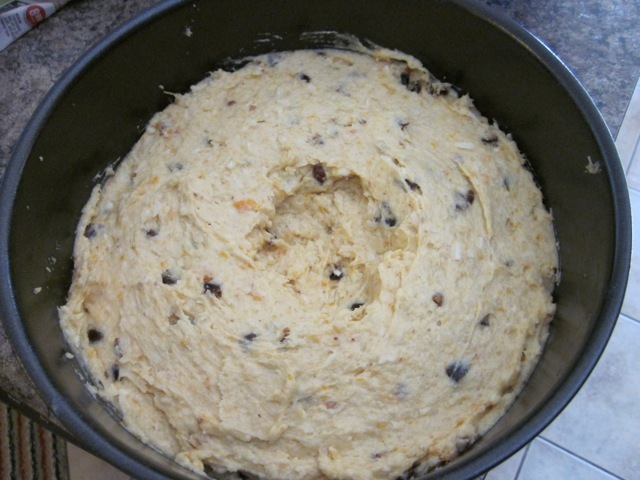 My cookie dough is chilling to make coconut lime cookies for St. Patrick’s Day at school tomorrow. My dad is coming to dinner tonight too, boy am I exhausted! This cake looks so yummy too. I love sweet potatoes, just had one for lunch. I will have to try this sometime. Thanks for sharing and enjoy your Sunday. Your day seems to be so full and I really admire the way you’re still able to cope. You are so versatile. I keep my fingers crossed for you and hope everything will work out fine for you by the end of the day. I wish you all the best and a great week ahead! I’m so glad you managed to go through the day and thank God your hubby helped and even made a cocktail. I hope everything has finally settled down. I wish you a goodnight and the best of the new week! Take care and best wishes! Sweet potatoes are something I often buy but then neglect to use! I will have to make this the next time I realize that I have some sitting around, waiting for me to cook them. 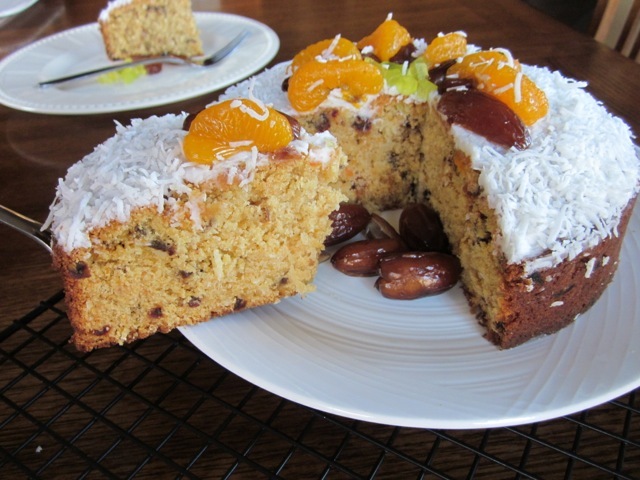 I also love the combination of coconut, dates and orange — sounds like a fantastic cake all around! Sweet potatoes are the only veggies I ever buy and use without delay. Please boil them, then mash them and turn them into a lovely cake. Dates are one of my favourites too. I wish you a happy baking and a wonderful week! What a nice looking cake! I wonder if I can replace sweet potato with cucurbita moschata pumpkin. It has similar texture. You can replace the sweet potato with anything mashed that pleases your palate. Pumpkins is absolutely okay. I hope you are feeling much better after drinking hot water and white honey. Are you not sleeping? It must be 4.00am in the morning right now! Enjoy your Monday! Oh, this looks amazing! Great photo and I the recipe sounds like a cake I’d actually make. 😉 I am not a big dessert fan for the most part. Thank you for following my blog and for your kind comments. The cake actually tasted very nice. I hope your find time to make it. I wish you a happy week. Best wish! This looks SO delicious! Yum! Real beauty , this cake ! Would love to make this during one of our festivals . Thank you Ralph. Enjoy Sunday! Thank you, again. I wish you a very happy Sunday and the best of next week! I love chocolate too and other combos…enjoy Sunday! Thanks for visiting my blog and for complimenting. I wish you a happy baking and a lovely Sunday. I’ve enjoyed browsing your blog. You have wonderful photos. Thanks for the kind words too. Best wishes! Oh wow, this looks amazing! I have looked for the potato banana bread and found it,. I’ll try to make it during the week. Oranges and lemons sound great…with regard to citrus I love lime most Have a wonderful Sunday. Thank you, Liz! I hope you’ll like the results. Thank you, Ronit. I look forward to trying the recipe. I shall give you a feedback! Thank you for bookmarking. Best wishes!